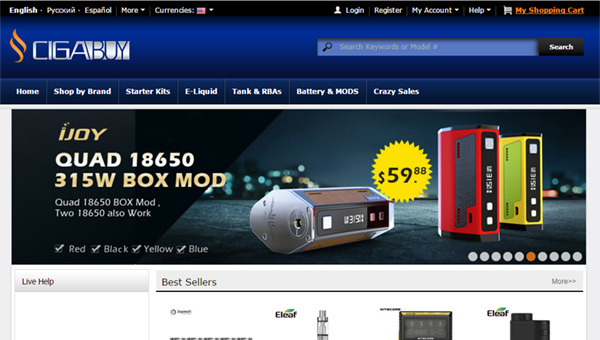 CigaBuy is a Chinese online shopping website with a vast assortment of safe electronic cigarettes and accessories for e-cigarettes like liquid flavors, batteries, chargers, atomizers and many other accessories. TinyDeal Company found the shop and its headquarter locates in the city of Hong Kong. The prices on most of the products look pleasant. In the "Crazy Sales" section you can find all the best offers. You also get a refund guarantee in terms of 45 calendar days from the date of your purchase. CigaBuy has prepared a great variety of excellent electronic cigarettes for its clients. There are items of different brands, styles, colors and construction. The company always tries to follow the tendencies and sell items that are of a high popularity among buyers across the world. Due to that, they have gained a great success. You can pay with PayPal, Сredit Сards, and the Western Union. With such variety of payment methods this store is a good place to buy from for clients from all over the world. CigaBuy offers you excellent complex service for customers at every stage of the purchase and delivery. They have no free delivery, but it is very cheap. Also, it is possible to use express shipping. The partnership with international delivery companies like DHL, EMS, and UPS provides quick delivery of the product to more than 200 countries across the globe. I bought an e-cigarette by Cigabuy. I am very satisfied with quality and the price of the product as well. I recommend this shop.